Club Penguin Cheats by Mimo777 Club Penguin Cheats by Mimo777: Herbert In Hibernation! Yikes! That sound cold! Orders soon! Herbert will be too cold to do anything but moan when we attack! Mimmo!! Clubpenguin has a new Whats New! It is called Elite Penguin Force Tubas? What does that mean??? 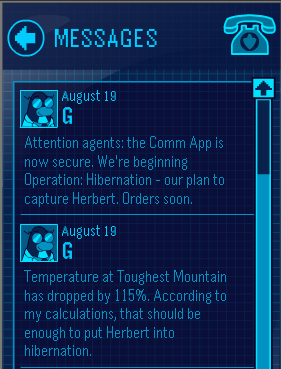 I've known that Herbert was at tallest mountain way before this though. That's how he found and rebooted Protobot. I was thinking rookie would ruin everything like forgetting the Comm App wasn't secure and said "Hey Guys, When's Operation: Hibernation starting? This plan to catch Herbet sounds great"